An Akula-class Russian submarine of the Northern Fleet on the surface. Russian MoD. That free lunch had been the ability of American submarines, combined with other sensors, to locate and track Soviet subs, especially their ballistic missile submarines, seemingly at will. In one acknowledged account from a 1978 mission, the USS Batfish tracked a Soviet Yankee-class sub for 50 consecutive days. The Batfish began tracking the submarine above the Arctic Circle in the Norwegian Sea and trailed the Yankee for nearly 9,000 miles, maintaining contact for the duration of the Yankee’s deployment to the Western Atlantic, where it could launch missiles at the U.S. But as the Batfish was making full use of the acoustic advantage American submarines enjoyed, the Soviets had begun to design and build a third generation of nuclear subs. These submarines would become the quietest subs the Soviets had ever constructed, having benefited from information passed along by John Walker, a U.S. Navy communications specialist who began spying for the Soviets in 1968. Among other things, Walker gave them information about a system of underwater hydrophone arrays on American subs that were strategically located to detect Soviet submarines. Something else that helped? By the mid-’80s, the Japanese company Toshiba and the Norwegian firm Köngsberg Vaapenfabrikk was selling equipment to the Soviets that would allow them to make their submarines even quieter. Toshiba transferred sophisticated milling equipment while Köngsberg provided advanced computers to run that equipment, which would allow the Soviets a higher-degree of precision when it came to making propellers more muted. For their part, the Soviets called their newest class of nuclear-powered attack submarine Project 971, and also Shchuka-B, or pike, an aggressive species of fish. It would emerge an impressive machine, as beautiful as it was capable. With its streamlined sail, the submarine looks as though it belongs in the ocean’s depths. Soviet shipyards would complete 15 Akulas between 1984 and 2009 in four sub-classes: seven Akula I (Project 971), six Improved Akulas (Project 971I), one Akula II (Project 971U) and one Akula III (Project 971M). The Akula is a large submarine, with the earlier boats measuring 362 feet in length, along with a 45-foot beam that accommodates a double hull system common on Soviet subs. Later designs of the Akula II and Akula III would see the submarines increase eight feet, with the extra length designed to provide additional quieting measures. At 12,770 tons submerged (the Akula II and III were larger, displacing 13,400 tons) the Akula was significantly bigger than the American Los Angeles-class, which was less than 7,000 tons submerged. Despite not being made of titanium, the Akula had a reported test depth of 1,970 feet. Of the Akulas built, all but one carried a large pod atop the rudder for a passive towed array sonar that the submarine would trail behind. Built to carry a large number of weapons, the Akula was equipped with eight torpedo tubes arranged in two horizontal rows of four in the bow and could carry 40 torpedo launched weapons. Additionally, six tubes are visible in the bow of later built Akulas that house the MG-74 system, which launches very large decoys. One thing the Akula lacked? A modern sonar suite that could truly exploit the submarine’s capabilities. The MGK-540 sonar is an advanced system, but still no match for the latest American systems, with their advanced processing power combined with a higher level of training. Meanwhile, as the Cold War ended and the Russian economy began to falter, funds for continuing the production—or even finishing Akulas—started to evaporate. Many hulls would lay unfinished in a shipyard on the White Sea. Two Akulas that remained dormant, Rhys and Kuguar, would contribute significantly to the construction of the new Borei-class SSBN. The bow and stern of the unfinished Akulas were used to bookend the Yuri Dolgoruky and Aleksandr Nevsky, the first two Borei SSBNs. For much of the Cold War’s early years, the American Navy saw the threat of Soviet submarines as two-fold: hunting for large groups of surface ships, like carrier battle groups or amphibious forces, and disrupting the Atlantic’s lines of communication. If the balloon went up in Western Europe and hordes of Soviet tanks rolled through the Iron Curtain, it would be a battle for survival, and to keep the fight going supplies would be needed from America. It was expected that American sub forces would have to battle swarms of Soviet submarines across the Atlantic as material and troops were convoyed to European ports, and much of the American effort was directed to accomplishing this goal. The Soviets, however, had closely watched the battle in the Atlantic during World War II, when American and British aircraft and warships fought German U-boats of the Kriegsmarine in a bitter contest of wills that cost nearly 100,000 lives. For these reasons, the USSR had no interest in being part of a new battle in the Atlantic. Instead, the Soviets planned their submarines to be held closer to shore, attempting to disrupt the ports where the war supplies would be delivered. By attacking these merchant ships with torpedoes and mines, or by attacking the ports directly with nuclear weapons, the Soviet strategy was to not become entangled in war of attrition across the Atlantic Ocean. The Soviets also tried to keep close tabs on their American counterparts, deploying nuclear fast-attack subs to hunt down American submarines in case war broke out. These Soviet subs would loiter along the coast of submarine bases hoping to catch the trail of an elusive American boomer. Soviet subs also stalked the waters outside the American naval base at Holy Loch, Scotland hoping to find a submarine departing on patrol. In November 1974, the USS James Madison was departing Holy Loch when a Soviet Victor-class submarine found it the hard way after the James Madison submerged on top of it. Both subs were damaged and each returned to their respective ports unassisted. Indeed, the problem for the Soviets was that they had terrible luck at finding the American boomers. Realizing this, the Soviets re-tasked some of their attack boats to guard their own subs, which were beginning to patrol close to the USSR as the range of their submarine launched ballistic missiles increased. The Soviets made their largest gains in submarine construction in 1980 with the commissioning of the first Oscar-class sub. The U.S., as ever was already ahead, with 62 Los Angeles-class units entering service between 1976 and 1996. But the Oscar-class, which the Soviets called Project 949, was a true leap in technology from previous designs. A very large submarine, the Oscar would have a greater displacement than the American Ohio-class of ballistic missile submarines. Four years later, the Soviets commissioned the Sierra and the Akula, the Sierra being built with a titanium hull while the Akula’s was constructed with steel, though the cost and complexity of producing titanium limited the Sierra program to just four submarines. The Akula, though, would be eventually be built in two separate locations: Komsomol’sk in the Pacific and Severodvinsk on the Kola Peninsula, in northwest Russia. It was, for thirty years, Russia’s best sub, before the first Yasen-class subs were commissioned in 2013, 20 years after construction of them began. 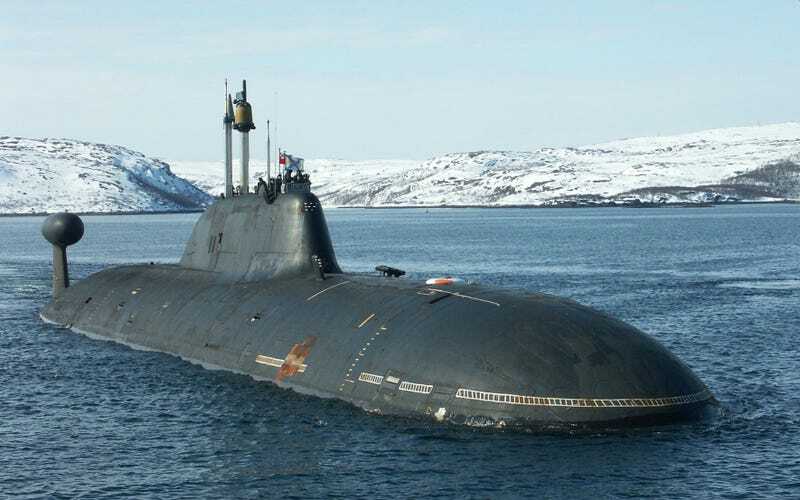 In 2004, India signed an agreement with Russia to lease one Akula submarine for 10 years. At a cost of nearly $1 billion, it was the second nuclear submarine the Indians had leased. Between 1988 and 1991 the nation rented a Charlie-class sub from the USSR, mainly for the Indian Navy to obtain experience operating a nuclear submarine. The new sub began life as the Nerpa, an Akula II design that was laid down in 1993. Due to a lack of funds following the collapse of the USSR, Nerpa lay unfinished in a shipyard in Russia’s Pacific until the agreement with India was signed in 2001. Originally the Nerpa was to be completed and delivered by 2007 but did not undergo sea trials until October 2008. One month later, on November 8, disaster struck, when the Nerpa was conducting sea trials in the Sea of Japan and it suffered a mechanical failure of its chemical-fire suppression system, killing 20 and injuring many others. It could’ve been worse: The boat was reportedly carrying 208 people during what was a test of the submarine’s systems. But with the ship full of workers overseeing the trials, there wasn’t enough emergency breathing options to counter the effects of Freon gas. Still, on January 23, 2012 the Akula finally joined the Indian Navy as the INS Chakra, and has spent the first five years patrolling the Indian Ocean, providing India a modern nuclear-powered fast-attack submarine that is among the best in the world. With half the lease remaining, India is pursuing another Akula to lease from Russia beginning around 2022. Last week, it was reported by Indian news outlets that Chakra suffered an accident, most likely in August of this year, that damaged the submarines sonar dome. The damage is expected to require substantial repair work before the submarine could return to sea duty. No definitive account of the incident has been released by the Indian Navy, however, it seems likely that the submarine was either involved in a collision at sea or was damaged returning to its homeport of Visakhapatnam through a grounding event. Two Akulas aboard a heavy-life vessel being transported from the Pacific for repairs. The Bratsk is on the left with Samara on the right. The size of the Akula is evidenced by the man in the lower right. In 1989, just two years before the Soviet Union would cease to exist, eight classes of submarines (Delta IV SSBN, Typhoon SSBN, Kilo SS, Victor III SSN, Sierra II SSN, Akula SSN, Oscar II SSGN, and Paltus SSAN) were under construction. The Soviet Union had invested heavily in its submarine force toward the end of the Cold War and the Akula was going to be the USSR’s rock star of its undersea fleet. However, less than five years later the USSR was gone and Russia was struggling to find itself amongst upheaval. The proud submarine fleet fell to ruin and sat tied to piers rusting away. Of the 15 Akulas built, only 11 are considered active, but that number is inflated with boats undergoing modernization and refit. At best, it is estimated that as few as four Akulas are operational with the Russian fleet, and as many as six may be awaiting overhaul. But with the delays of the Yasen-class, the Russian Navy may be looking to invest more in the overhaul of the neglected Akulas, as the price to refurbish is significantly less than the estimated $3.5 billion for the Yasen-class. The operational Akulas, meanwhile, have remained active, with a pair detected off the East Coast in 2009. The subs were no doubt hoping to catch an Ohio-class American sub leaving Kings Bay, Georgia, for a deterrent patrol. The context of the statements has to be taken into consideration, as Boorda was looking to secure his budget, especially funding for the troubled Seawolf-class that was over budget and delayed. Yes, the Akula was the quietest submarine the Soviets built, up until the Yasen sailed, and it did change how American submarines operated, especially up north in the Russian backyards. But experience has proven that the sub could be detected and tracked; American boats, now, just have to get a whole lot closer than ever before.